So you've decided you want to give a TEDx Talk - huge congratulations. Making that decision can really be a life changing decision and I highly commend it to you. The TED format is a unique speaking experience and I share your excitement. 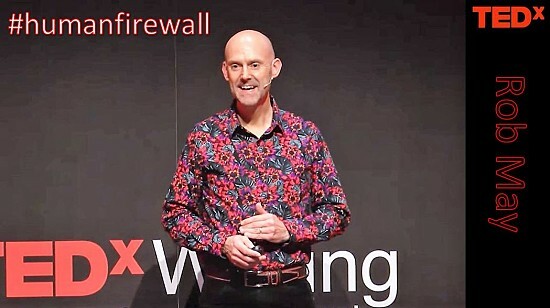 In November 2017, I gave my first TEDx talk which I called Your Human Firewall – The Answer to the Cyber Security Problem. The response around the world has been incredible, and I am often asked to offer guidance to others who are taking the stage to give their own talk. The following thoughts and 15 pointers are my advice to you before, during and after your event. Giving a TED Talk is like no other presentation, and its principles, construct and power is a fantastic tool when delivered properly. My own talk is by no means perfect and, given my time again, there are improvements I would make. However, that learning has come from living the experience, and if by reading this I help to improve your presentation and the experience, then that can only be a good thing. Every TEDx event has a theme, so the first thing is to ensure is that what you want to talk about fits the overarching subject. In my case, before I'd even secured a place I had written what I thought was going to be my TEDx Talk. It was on the power of positivity. I'd given the talk to a couple of different business audiences and I was honing it into what I thought was a great talk. When I got to the top of the list at my local TEDx they asked me what I wanted to talk about, and when I told them they said no! It didn't fit the theme of the day and I needed to talk on Innovation and Technology. So I suggested four subjects that I felt passionate about and the chosen one was cybersecurity. My initial response was that, of all the subjects, cybercrime was the least positive subject, which was amusing given my original intent! Your intent is of vital importance when it comes to a TED Talk. The strapline of the TED organisation is 'ideas worth spreading', so from the outset you need to be clear: what is your idea and what message do you want the audience to take away and spread? In any presentation it's good practice to start the construction of your talk with your closing statement; consider the call to action and what you're trying to achieve and then work out how you're going to get there. Too many talks run out of steam at the end or lose their impact. Be clear of your intent, state it within your talk and make sure you use it in a strong close. The aim is to make your intent memorable. People will look at the subject title of your talk and make assumptions, then you'll walk out on to the stage and you have a very small window in which to make an impact and grab their attention. If you've watched my TEDx Talk you'll know that I opted for a mixture of humour and shock to do this. Guaranteed, I got the audience's attention as this isn't what they were expecting. So consider, in your opening moments how will you position yourself and your subject in order to grab their attention? The American poet Alfred Mercier famously said (what is probably my favourite quote): "What we learn with pleasure we never forget". As a speaker, part of your job is to entertain - giving your talk isn't for your benefit alone, it is for the benefit of the audience and I would urge you to seriously consider this. The TED environment on the day is incredibly friendly and supportive, and people will want you to succeed, but if they're not entertained you'll quickly lose them. The other thing to remember is that your real audience is not the people sat in front of you on the day that you're speaking, it's the people who will go on to watch you online. This means that if you're not mindful of the tips I'm sharing they'll simply not continue to watch your talk, surfing to find something that does delight them. What you wear is also an important consideration. Obviously it needs to be something that will work in front of the camera, so it's best to avoid dressing all in black (as stood in front of the black TED background you risk appearing as a floating head) and don’t wear high contrast checks (If you do then the picture on the video version of your talk will likely strobe). Most importantly, however, when it comes to what you wear, it needs to be something that won't alienate your 'real' audience. If you watch all the really successful TED Talks you'll notice how casually the speakers are attired. Your local audience is not your true audience and if you appear in a suit and tie you will immediately alienate a vast proportion of your potential worldwide viewers. People get swept up in the passion of a great speaker. On the basis that you've been moved to take to the TEDx stage, I'm assuming you feel passionate about your subject. This being the case, you need to show that. Tell people why you care, why it matters to you and why you think it should be important to them; implore them to take notice and, when you've finished, ask them to help you spread the idea. Please avoid jargon at all costs. If there is an element of your message that relies on it, then you need to make sure that you clearly explain yourself and help your audience to understand. Nobody likes to feel foolish and, what's more, in a TED Talk no one gets the opportunity to ask any questions. I share the view of Albert Einstein on this one when he said "If you can't explain it to a six year old, you don't understand it yourself." When it comes to content, less is more! Unfortunately I've witnessed gifted speakers fail at TEDx because they've tried to take a brilliant one hour talk and deliver in 18 minutes. This might be a clever thing to do but it leaves your audience reeling and discombobulated. Cut content out of your talk and just use what you need in order to communicate an idea worth spreading. All great communicators use the power of storytelling. We're wired to understand and spread messages in this way, so where possible use that in your talk. What stories can you use to share the message? Ideally make them personal and show vulnerability, again don't use anything that might make your audience feel hostile to you. In my own talk I started with a trick (which is unfortunately rife on social media). When I tried my talk out on a couple of different audiences the feedback was that they felt resentful until I started sharing my own results and then it was ok - hence that's what you see on the day of my TEDx Talk. There are mixed thoughts when it comes to visuals in a TED Talk - some people don't use any, some will use props like Jamie Oliver or some might use a flipchart like Simon Sinek. The thing is you have a MAXIMUM of 18 minutes to do your talk and as a rule you don't have any notes to guide you (you'll sometimes see people with notes but it's not encouraged). Personally, I used some slides. Firstly, I thought it would help keep me on track! But I also believe that some of the audience will always take in the message easier with visual prompts, I also used a short video clip to really demonstrate a point. If you want to do the same there are some pointers. Firstly you need to have permission from the copyright holder (TED will not disseminate anything that breaches copyright); secondly that copyright needs to be acknowledged on the images (I showed mine vertically in the bottom corner of each slide); and if you do use video, the recommendation is for it to be no longer than one minute. Taking to the TEDx stage is not something you're going to do many times in your life and it's a tremendous opportunity. It will also be recorded and will live online for in perpetuity - so you want to get it right! Give yourself enough time to write your talk and to present it to an audience (ideally several) and, each time you do that, interrogate them for feedback. I use the WWW-EBI method: What Worked Well? Even Better If? Listen to what they have to say, shape your talk and try again. Make sure you're well within the 18 minutes too, as on the day you may need to allow for laughter (in a good way!) which will eat in to your allotted time, so plan for this. What are you going to call your talk? The challenge here is that you need to meet the requirements of the local TEDx organisers on the day, and your talk needs to fit into their theme (as discussed above). Thereafter, the talk needs to be something that people are going to search for and watch online. When I did my talk, there were maybe a couple of hundred people in the audience. Since that time, the views have exceeded 100,000 so if I'd got the name wrong that would have limited my potential reach (even so, with hindsight I'd further refine my title) but think about what question does your talk answer. What might people search for and does your title offer a solution or an answer? In addition to the Talk title, you need to consider its billing. This will be used in the local event brochure but when it's listed online it will also carry a description. Unfortunately, once you've been listed there is no way of changing this. My recommendation is to provide a description for the event and a description for online copy. The description that went with my talk was perfect for the local audience but nonsensical when the same one was used online. Use the power and positivity of the local audience on the day - they will boost your confidence and you will get an almighty high when you've finished. But remember that they're not your true audience, which is sitting at the other end of the camera. It really helps to be mindful of this. Once you've done your talk, assuming it meets the TED standards, it will get listed online within a few weeks. Once this happens, it's up to you (and you alone!) to promote your talk. Think about how you might do this: obviously look to your own business to promote it but also your other networks - who are you connected to on social media? Be sure to tell them that you've done a talk and ask them to share it. I got press coverage, spoke about my talk on local radio, and went on to write two books which you can see here and here. That social media sharing of my talk opened countless doors with invitations to talk and do keynotes at events all around the world, which truly is a blessing, but having spoken to many other TEDx speakers it does take effort and you need to be responsible for telling people your talk's there. I hope that these thoughts are helpful to you. My own TEDx journey has been one of the most rewarding things I've done and I am proud to be one of the alumni of humans all over the globe who have summoned the courage to stand on the TEDx stage.